Eve Franklin is a normal teenager until she visits a hidden world with her friend Will Farley, a Guardian of Arkazatinia, and her life takes an unexpected turn. Eve asks a question which alters her destiny and sets her upon a course fraught with peril. Her path is not all adventure and Eve finds adjusting to her new life difficult. Lonely and unhappy, she seeks the friendship of Calab, a moody and heavily conflicted demon, whose advice is … unconventional. 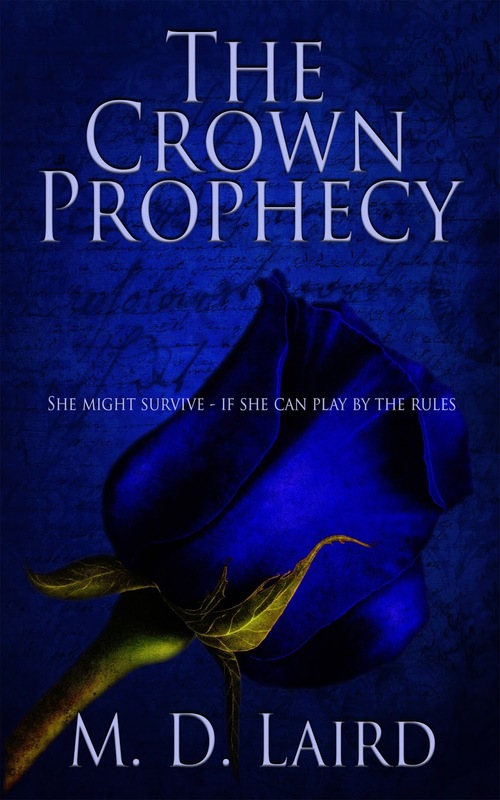 As the threat against her becomes imminent, Eve must learn what she can about the Crown Prophecy to prevent the Crown falling into the hands of the enemy. Can she trust Calab and can she learn what she needs to know in time? “Where are we going?” asked Eve as she followed Will through the front door. The gravel crunched under his heavy footfalls as Will made his way quickly to his father’s car parked in the driveway. Eve climbed into the car’s passenger seat. She had barely closed the door before she was pinned in her seat as Will accelerated away from the house. She quickly pulled on her seatbelt. “Are we going after that thing? That man?” she asked. Will drove the car into a multi-storey carpark; he pulled the ticket from the machine to raise the barrier and sped up the levels to find an available space. After parking, they ran down four flights of foul-smelling stairs, entered the street and tore towards the train station. Will purchased two open returns for the next train to Milton Keynes, and they headed for the platform. The two left the waiting area and joined the small crowd gathering on the platform to board the train. The train was relatively quiet, and they managed to find an empty table. A couple and a small child, who was busily colouring a fairy princess, occupied the table next to them. Eve and Will sat opposite each other. “What is the world like?” she asked. Will glared at her to keep her voice down and looked at the family next to them who, amidst colouring and chatting amongst themselves, seemed not to have noticed. He reached into his pocket and pulled out a sleek pocket watch that appeared to be coated with some fluid-like substance. He opened the reverse of the watch to reveal a small control panel, which housed a screen displaying the words ‘NORMAL MODE’, Will pressed a red button on the touch screen panel and the screen now displayed ‘SECURE MODE’. “You mean to tell me that this space age cloaking device has been around since the twenties?” exclaimed Eve. Eve pressed her hands to her head as she imagined plausible explanations for every UFO disappearance she had heard of—did she just think this was plausible? Will had spoken calmly though Eve could see that his eyes were betraying a hint of anxiety and she stopped her questioning. They continued the rest of the journey in silence. Will gazed out of the window, the anxiety, which had settled on him briefly, had left his eyes and his expression gave nothing away. Eve felt a surge of anger rising in her stomach as she imagined all the lies he had told her and all the secrets he had kept from her. She swallowed the feeling and thought instead of everything that he had told her and everything she had seen that day. The world was so different from yesterday; yesterday supernatural beings were the subjects of fantasy: books, movies and TV dramas, but now they were real. She squeezed her temples to push a sharp pain that had formed behind her eyes into a dull ache. Will shook Eve gently as the train arrived at Milton Keynes Central Station; she rubbed at her neck, which was now sore from dozing off with her head on the window. Her headache, at least, had subsided. “It’s not far,” he said, leading Eve out of the train station and into the streets. They walked for around ten minutes with Will using a map feature on his pocket watch to guide them. “We’re here,” he announced as they approached a large glass fronted building. Will opened the reverse of the watch to reveal the control panel; he selected a new menu, and a lock replaced the speech display. Concealing the watch from view, he entered a password and instead of the theatre, they saw a beautiful neo-classical building fronted with massive columns. Eve stared at the material used to construct the building, it looked like stone, but it moved, only slightly, but it definitely moved! Will laughed as he rang a bell at the door of the Guild of Procnatus and said, “No, the organic matter used to make books dies just as it does in our world.” An incredibly handsome man answered the door; Eve felt her mouth fall open at the sight of him. The man invited them into an elegant waiting area. Despite the grand exterior, the building did not have a vast entrance hall or high ceilings and instead showed a practical use of the great space. Both Eve and Will, expecting a breathtaking scene, found it a little disappointing. They were invited to sit in the waiting area chairs, which had the same ‘living’ properties as the building. Feeling a little creeped out, Eve preferred to stand. “Did you say Her Lordship?” she asked. Her eyes ventured towards the organic floor, and she began to shuffle uncomfortably. Will started to laugh, but quickly silenced himself as the door opened and a young woman entered. She appeared to be around nineteen or twenty and was incredibly beautiful. “This way,” she said, indicating for them to follow her through the door. She led them down a corridor rather grander than the entrance hall. The walls of the corridor were filled with portraits and news clippings of scientists and scientific feats through the ages. The walls were lined with display cabinets containing a trove of apparatus, gadgets and what looked like random junk. It should have looked cluttered, but its beautiful arrangement could easily pass for an exhibition. The girl led them into a large office and motioned for them to sit on two chairs in front of a solid oak desk. The office was like a library/laboratory hybrid. The walls were lined with thousands of leather-bound volumes, and more cabinets displayed everything from crude tools to microscopes and numerous planetarium and orrery models. Eve and Will sat (Eve was relieved to find that the wooden seats did not appear to move) and were surprised to find the girl had sat opposite them. “You’re Lord Thalia?” stuttered Will, blushing furiously. Thalia pressed a button on a panel on the desk. “Yes, My Lord?” came the crackled reply. Will stopped as the door opened and another handsome male entered with a tray of food and drinks. Eve stared at the man who was even more beautiful than the man who had answered the door. Breathe, she told herself. “Eve Franklin,” said Eve, her cheeks burning. “And head tea boy and bringer of scones,” Mikæl said, he winked at Eve and she blushed furiously. Mikæl appeared intrigued and perched on the edge of Thalia’s desk and folded his arms. Eve peeled her eyes from his bulging biceps when she realised that she was not breathing. “That’s an Asmodeus demon,” observed Mikæl. Thalia showed no reaction. “I called out to my father to ask if everything was okay,” continued Will, “and the demon grabbed me and said, ‘I could take him, I could take him somewhere you’ll never find him.’ My father shouted at him to let me go and said he would do what he asked. Eve heard the raised voices and came into the garden. The demon moved from me to her, he taunted me and said that he could easily kill her. I shouted at him to ask what he wanted. He laughed at me and squeezed Eve around the neck. I tried to fight him off, but he threw me across the garden. Eve pulled down the collar of her sweater to reveal the bruises the demon had left behind. Thalia had stood and was pacing nervously as she listened. “What do you mean?” asked Eve. “It’s a common misconception,” said Thalia, “demons aren’t inherently evil, like everyone they are both good and bad. They have a role to play in the world like everyone else and that role is to provide balance. They challenge people, tempt them from righteousness to test who proves worthy to enter paradise. The demons were angels once, but they tired of the oppression they faced under Heaven’s strict rules and started a rebellion, which got very messy and saw them cast out. They formed Hell, their own system and lived by their own rules. “What option is there?” asked Will anxiously. “Of course, my queen,” he smiled. “I want to go too,” said Will. The transport Thalia had requested was a vector. It resembled a horse-drawn carriage, but required no horse and propelled along silently at great speed. Eve could not identify a power source, but assumed it had some sort of battery as it had an electronic control panel programmed with the destination. The vector sped away from the guild so fast that Eve could only see the distant landscape of Arkazatinia, anything closer blurred. It was charming and very like the English countryside. “Is your home based on the British Museum?” asked Eve. “Thank you,” Thalia smiled back. Eve’s curiosity was piqued and she had a ton more questions; however, she worried that she was becoming an annoyance and bit her tongue. Despite the speed, it still took almost an hour to reach the Guild of Asmodeus. The guild was also built in a classical style and was smaller than the Guild of Procnatus but just as impressive. A demon met the group at the door. He had the same eye colour as the one who had attacked Eve and Will that morning. Eve guessed the species of demons shared characteristics, which was how Mikæl was able to ascertain who had attacked them. The demon led them through to an impressive library, Eve gasped—the library was so vast she thought it must house every book ever written. Sat in an armchair aside an open fire was the demon who had attacked them. His face made Eve gasp and although he appeared much calmer than he had that morning, his appearance was quite terrifying. He looked to be no more than twenty and had a lovely mop of black, curly hair, but his thickset features and a cruel twist to his mouth gave the impression of an ancient evil lurking within. He could have passed for human, albeit an unattractive one, had it not been for his eyes. They were like brilliant green emeralds or marbles, or as Will had described—like glass. He also had long, deadly claws, which protruded about two inches from the end of each finger. “Calab,” smiled Thalia, extending a warm greeting. Calab bit his lip and relaxed into his chair. “Why are they so determined to run us out?” he asked. The door opened and Charon entered with Andrew Farley, who looked furious. Eve nodded and gave a thin smile. She thought she would be filled with hate for the demon who had left her bruised and fearing for her life; however, she was surprised to find she sympathised with his plight. Calab shuffled in his seat, his brow furrowed with irritation, “Well, it seems everyone has drawn that conclusion,” he said dejectedly. “You would too if you thought anything through!” continued Andrew. “So, we rally our armies and start a rebellion!” stated Calab. MD Laird is from a small town in the north of England. Her hobbies include drinking tea, eating biscuits and daydreaming … lots of daydreaming. When she is not reading and writing, she is daydreaming.